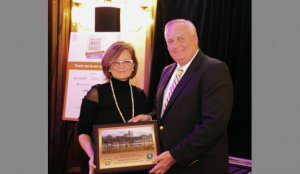 The Savannah Area Chamber of Commerce held their annual Chamber of Commerce business awards banquet last month. Marjorie Young with Carriage Trade Public Relations was presented with the Helen V. Head award. Head was the first woman to serve on the Chamber of Commerce board, and she also owned and operated a CPA firm. Young, too, is known for championing small businesses. “When our small businesses are strong, our community will be strong,” Young said. Young stated that Savannah is blessed to have a helpful and productive small business community.